I have a small wrist, and while I'm able to wear the bracelet on my Explorer I if I remove all the links, the clamp isn't centered and it doesn't fit right. I've reversed the clamp/bracelet so that it opens from the opposite side for a better fit, but I want it to open from the appropriate side now. The only solution for this is to remove 1 fixed link from the 6:00 side of the bracelet. Yes, the last fixed link is still tapered, but it's so little that it won't be a big deal. I have removed fixed links on several oyster bracelets. Like you I have thin wrists, and in addition to this prefers a tight fit (If that was not the case I wouldn't have had a problem). 1. 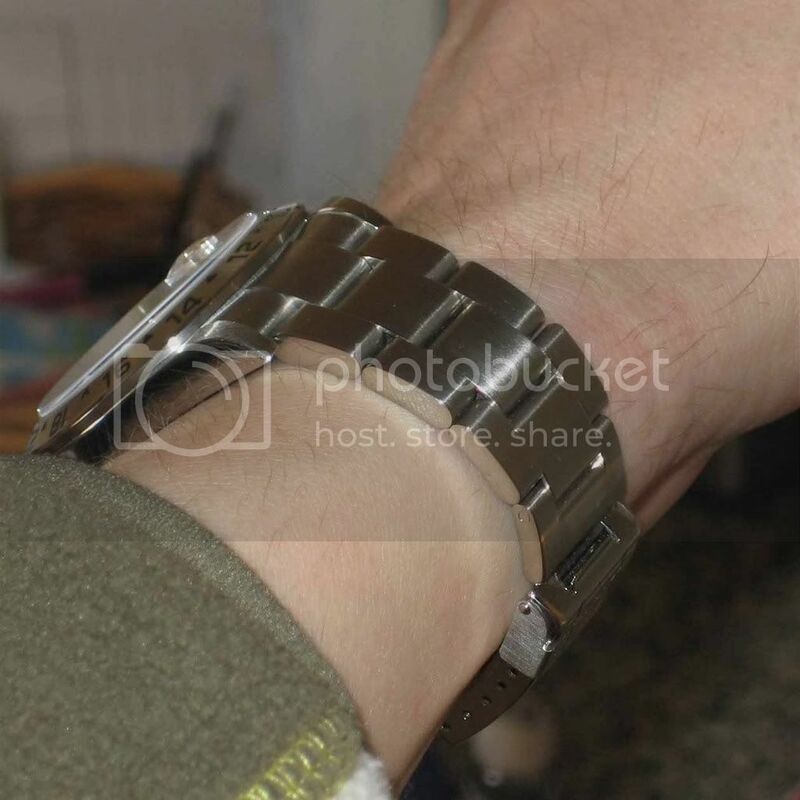 Remove the bracelet from the watch. 2. Remove the clasp from the 6 o'clock side (this is the side you want to shorten). 3. Remove all removable links. 4. 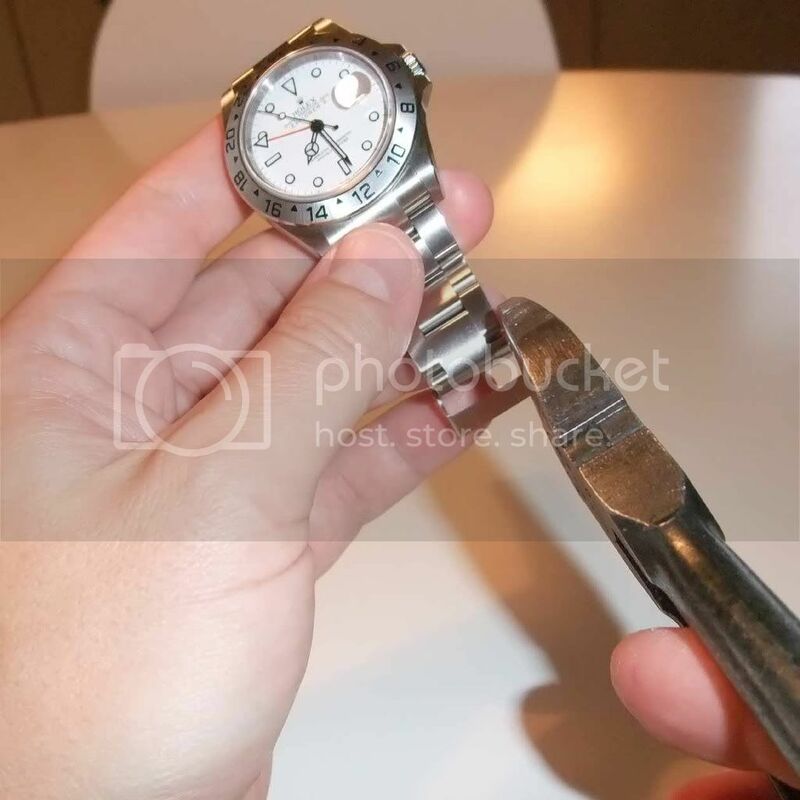 Now you have the last fixed link free to remove on a bracelet part that contains four fixed links, and the end part connecting to the watch. 5. Take two pairs of pliers/cutters, the sharper the better. 6. Press them where the outer parts meets the inner part of the oyster link you want to remove. Add pressure (really hard!). 7. Do NOT try to bend or pull on the outer parts. Just press down with the cutters in the gaps between the parts. If you press or bend or pull, the pins inside will grip even harder (that is how the operate - do not know the proper word for them). 8. Continue to apply pressure, and slowly the outer parts will start to move outwards. There should now be a growing gap, and the pins should be visible, and also start to loose their grip. Eventually one of the outer parts should "pop" off. 9. Remove the bits, and assemble the bracelet again. 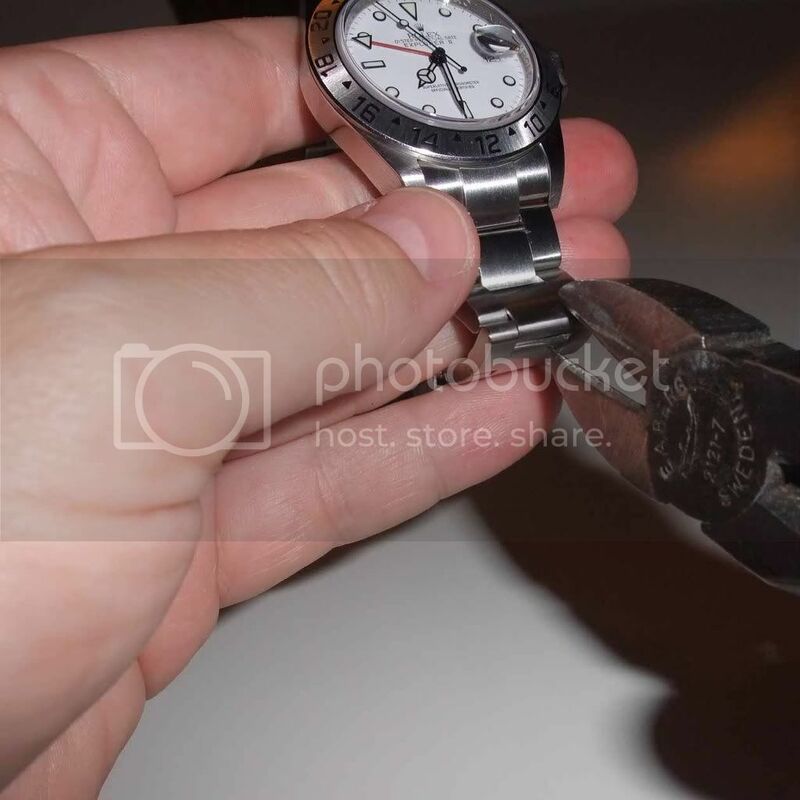 Make sure you have a good screw driver to avoid damaging the bracelet or the screws. I do not know if this made sense... it is truly difficult to explain. It takes five to fifteen minutes for me. Be careful not to touch the links that are going to stay, and be aware that the removed link will be destroyed. PM me if you want to discuss in detail. I'll see if I can find some photos of the result. I have no pictures of the procedure itself. The new solid oyster bracelets are a true improvement, since the new clasp is possible to attach in a way that makes the 6 o'clock side shorter. 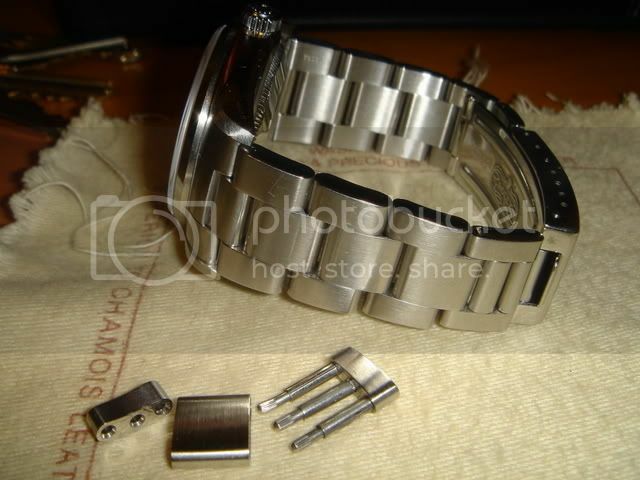 I have an 114200 Air-king that offers me a perfect fit removing only removable links. Same thing with Daytona bracelet. This one is lended from the internet (and I will remove it if the owner wants). It is not my watch, but it gives a very good picture of the link, and the result. Here is mine for reference of the end result. It is an Explorer II. The fit is perfect in my mind. Wow, sounds like a risky thing to DIY... I think it's better to get help from AD or reputable watchmakers. After reading this and similar posts, I really thought I had about as small a wrist as any man alive at just under 6.75. Guess I am not alone. Good luck in your down size and re-alignment. That would drive me nuts too. 2. 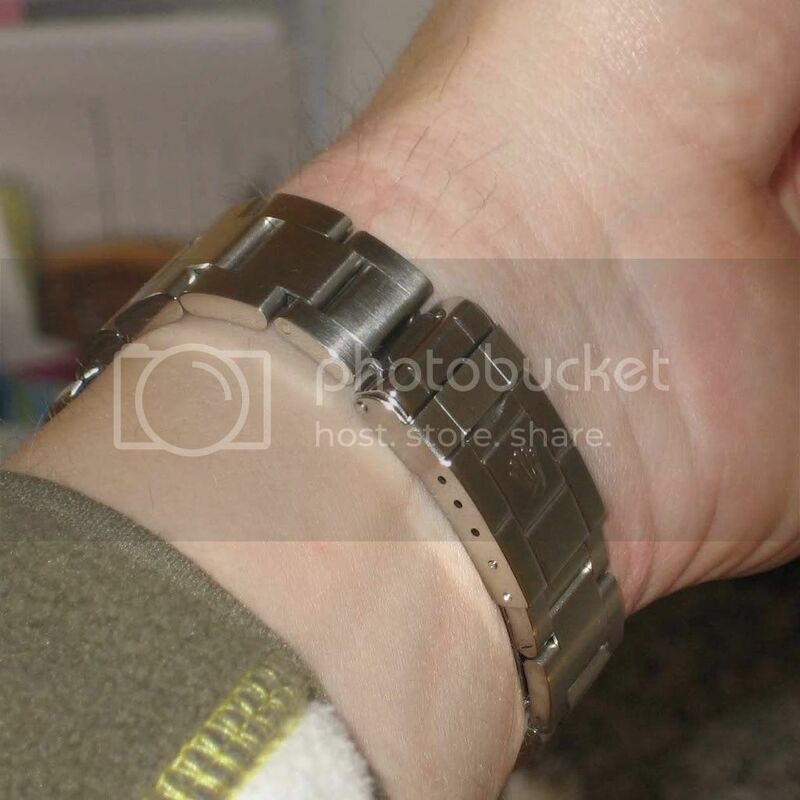 Remove bracelet from watch. Remove clasp from bracelet. Obviously this is done after the clasp has been removed, so the permanent link being removed is free. Here is a close-up. Imagine the links below the cutter not being there. As you apply pressure the gap between the middle and outer part will widen, and as the gaps grow wider the grip of the (hidden) pin will be lost. Do not try to bend the outer part to get it off. Do not put pressure on the outer part either, since that will increase the force keeping the pin in place. Here is again the (lended) picture of the separated link. I'll try to remember to document how I do this the next time I do it. In addition: Use tape to cover all parts. It is too easy to damage a link, that is supposed to be left. I did it the first time, but only on the inside (not visible). PM me if this is completely impossible to understand! YOu're braver than I........I'd let a pro do it! 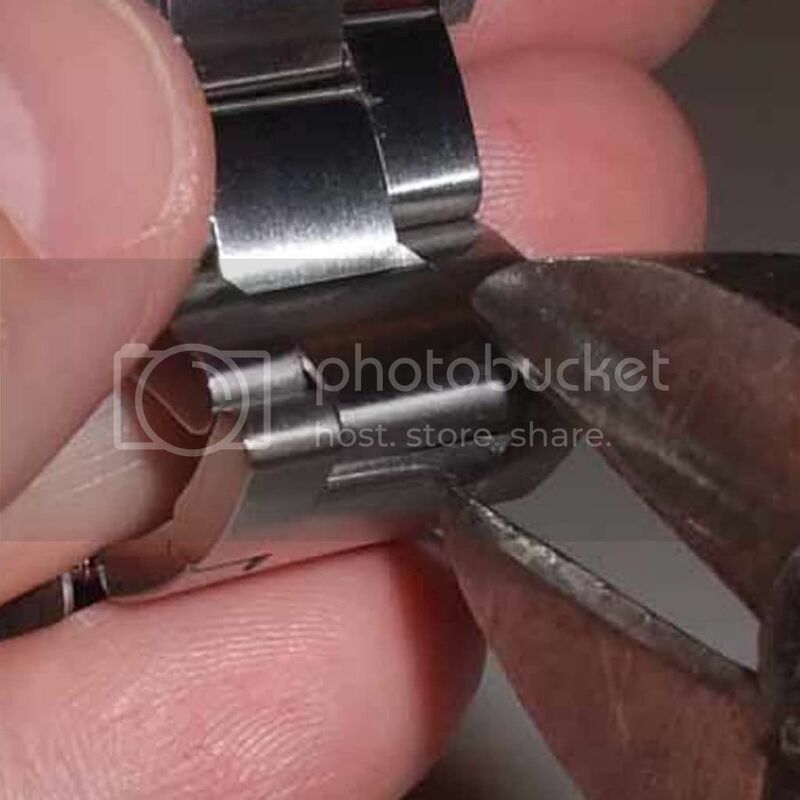 Nice suggestion but most watchmakers have tools to remove the link without damaging it I think. Alos, wouldn't you want to remove the link at 12 o'clock, not 6 o'clock, to get the watch to center correctly? A pro told me how to do it ;-) (Rolex watchmaker at AD). I understand your comment. It took me two years before I did it the first time, but then I decided to use my watches all the way, and make them fit me perfectly. Possibly they do, and of course the best thing is probably to go to an AD with in-house watchmakers or an RSC. In my case I am confident on how to do this. I was also told by a watchmaker at an AD (from whom I bought two Rolexes) how to do it. This is how he did it for customers. But as you say. There might be better tools. I do not know. looks like metal to metal contact would create scratches though. I'll probably take mine to the local RSC when I have time, but I want to be clear on something first. After a fixed link is removed, am I able to put it back on if I change my mind or want to sell the watch? In the picture posted, it looks like the removed outer portion of the link can be pushed back onto the rest of the link. Is that the case? I wish it were that simple. If you pay close attention, there's a step-off between the last 2 links in this picture. That's because the fixed link that was removed was tapered. All the removeable links are straight. Simply adding another link will leave an uneven "step" on the bracelet. I probably woudln't mind it that much, but if I were to ever sell the watch, it would probably drop its value a lot. I am told that once a fixed link is removed, it is damaged and can no longer be reused. As far as the resale value, sure it would drop but I would bet that most people would not even know how many links come with the watch. Only true WIS knows.... Plus, you still have all the removable links for larger wrists. Sorry to bump an old thread but after messing about with my bracelet for nine months since getting my watch have just removed a link from the 6-side of my exp II bracelet (I have small wrists) following acce1999's instructions and at long last it's a perfect fit with the watch and clasp perfectly centred. The instructions are perfect and the whole process took me no longer than 10 minutes! Hope this helps reassure anyone worrying about trying it while putting up with a bad fit on a small wrist! I've done this two more times since I posted in this thread the first time. I've done this to all my subs. It has never affected the resale value. It really makes for a much better, actually perfectly, centered clasp. I have 6.5" wrists, so it's a must. Oh, and the process took me 30 seconds. Rather than using the side-cutters, you can lay the bracelet flat, and using a pocket knife, lay the blade between the edges of the link to separate. Then tap the top of the blade with a small hammer and it will wedge between the two halves, spreading them apart. After they are spread a little, you can use small screwdrivers to further spread the link apart until it pops fully apart.. This way, if you are careful, it does not damage any links. 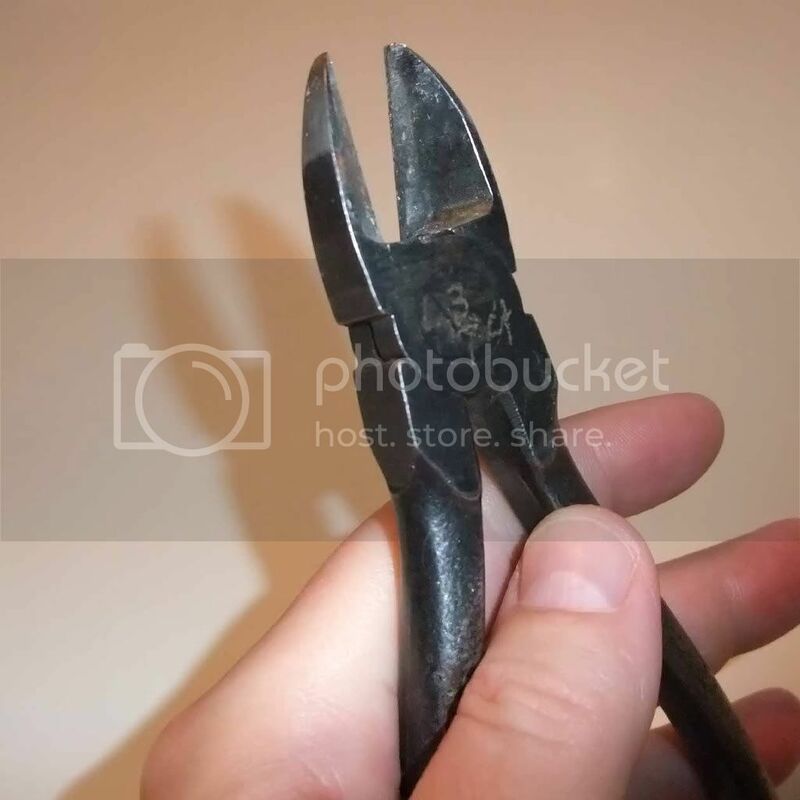 The link can be pressed back together with a little loctite and be almost good as new.. I will be trying this later today....I think. Rikki posted on this saying that the links are assembled with loc-tite (or something similar) and can be loosened by applying heat. That sounds like you might even be able to reassemble the link if you wanted. I would try a search (or PM Rikki) before using the metal-eaters on a Rolex band! Anyone ever removed a Jubilee permanent link?